The Mexican National Miners’ Union (Los Mineros) is challenging the results of a union representation election at the Finnish-owned PKC auto parts factory in Ciudad Acuña, Mexico. According to the official count, Los Mineros narrowly lost the vote – 2,311 to 2,509 – to a “protection union” affiliated with the Confederation of Mexican Workers (CTM) that was supported by the employer. Yannick Etiene is an organizer for the May First Union Federation and a member of the Haitian social movement Batay Ouvriye. MSN had the opportunity to speak with Yannick in Washington DC in October 2012. When Canadian T-shirt manufacturer Gildan Activewear purchased Anvil Knitwear in May 2012, workers at Anvil’s unionized Star factory in El Progreso, Honduras were understandably worried about their job security. After all, Gildan was the same company that had closed a wholly-owned factory in El Progreso eight years earlier in order to avoid having to accept and negotiate with a union. The death of more than 300 garment workers in a September 11 factory fire in Karachi, Pakistan has exposed the total failure of the provincial Ministry of Labour, the major buyer sourcing from the factory, and a US-based multi-stakeholder initiative to ensure respect for the country’s health and safety laws. The tortured body of Bangladeshi trade union organizer Aminul Islam was found by the side of the road on April 5 of this year, the tragic culmination of a history of attacks by Bangladeshi security forces on Aminul and the organizations in which he was involved. Can National Competitiveness Strategies Include Decent Work? A new study co-authored by the Maquila Solidarity Network (MSN - Canada), the Honduran Independent Monitoring Team (EMIH), and Professionals for Corporate Social Auditing (PASE - Nicaragua) challenges the conventional wisdom that competing on the basis of cheap labour is the only option for poor garment producing countries. Officially, special economic zones were created as a way to provide jobs for Filipinos by using tax exemptions and other incentives to encourage foreign investors to invest in the Philippines. Unfortunately experience shows that foreign investors and the government are the only ones to benefit from these economic zones, not the workers. 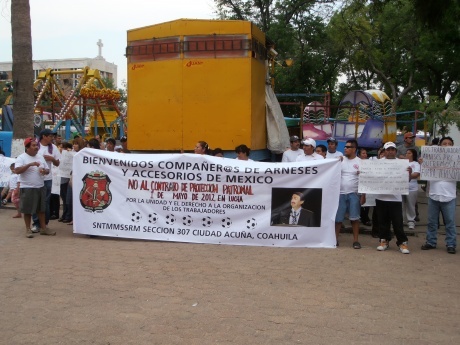 On December 20, 2010, unidentified robbers broke into the offices of the Worker Support Centre (CAT), a labour rights organization that has been supporting organizing efforts at two Johnson Controls, Inc. (JCI) factories in Puebla, Mexico, and ransacked the office, destroying equipment and causing more than 200,000 pesos (US$ 16,500) in damage. Take Action Now! Send a letter to the Mexican authorities demanding protection of the life and physical integrity of the CAT labour rights advocates. One hundred years after the birth of International Women's Day, today women workers around the world are celebrating their achievements and renewing their commitment to the fight for women's labour rights. On this historic 100th anniversary of International Women's Day, MSN reaffirms our commitment to the struggle for women's labour rights and to continue organizing to eliminate labour rights abuses in the garment and other industries. Jobs, yes, but jobs with dignity. In order to ensure that the power of municipal ethical purchasing policies (EPPs) is effectively used to improve conditions in apparel factories, municipalities should collaborate with other governments and public institutions. MSN believes that Canadian municipalities and possibly provincial governments should establish a Canadian consortium to jointly implement their respective EPPs.